The pole is being carved out of an 800-year-old, 23 metre-high red cedar that likely came down during a windstorm 50 years ago near Bamfield, B.C. Tim Paul is carving the piece at a time when his language, Nuu-chah-nulth, is at great risk of becoming extinct. Nuu-chah-nulth master carver Tim Paul has started work on a totem pole that intends to raise awareness of threatened Indigenous languages. 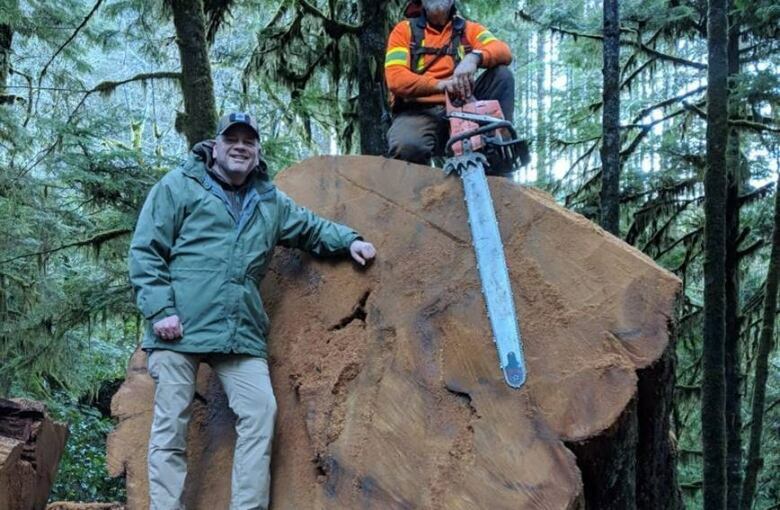 The pole is being carved out of an 800-year-old, 23 metre-high red cedar tree that likely came down during a windstorm 50 years ago near Bamfield, on the west coast of Vancouver Island. The totem pole is being created in honour of the United Nations Year of Indigenous Languages. Paul is carving the piece at a time when his language, Nuu-chah-nulth, is at great risk of becoming extinct. "We really need to not only deal with the language and save what we have left, but we also need to upkeep and re-educate ourselves of the cultural teachings within our families," Paul told All Points West guest host Megan Thomas. Paul is of the Hesquiaht tribe of the Nuu-chah-nulth,and says this project is special to him because his grandmother was very concerned about their traditional language. "She revered the language, she spoke the language and she wanted to hold it and pass it on down to my aunts and uncles," he said. According to the UN, 2,680 languages across the world are in danger of disappearing. There are fewer than 150 known fluent speakers of Nuu-cha-nulth, according to the First Peoples' Cultural Council. Paul says the totem pole project is meant bring Indigenous language speakers, elders, communities and children together in order to speak in their languages and learn, and so preserve them. Paul chose to represent stories and themes that honour 10 relatives of the Nuu-chah-nulth people — sky, sun, moon, mountains, rivers, lakes, land, sea, wind and stars. The earthquake will also have a place on the pole, intended to teach humility. "The earthquake can very quickly remind us of our place in this world, but also remind us that we are the very smallest part of this universe," Paul said. The totem pole, commissioned by the First Nations Education Foundation, is being carved in Port Alberni and is projected to be completed by November 2019. It is scheduled to be raised at the University of Victoria that month. Paul says the Nuu-chah-nulth believe they are related to nature, and must respect it. The totem pole will represent those values. "As the years go by, hopefully we can pay attention to that law of nature where we don't condemn anything to extinction," he said. With files by All Points West.